Designed by D. Brad Talton, Jr. In Pixel Tactics, 2 players use identical decks consisting of 25 cards. The characters and game take place in the World of Indines (along with other popular Level 99 Games such as BattleCON and their game currently being successfully funded with many stretch goals, Argent). While the game has a certain amount of luck involved with the drawing of cards, the game is tremendously well balanced because each player is playing with the same deck of cards (now this can be modified with multiple copies or versions of the game if desired, but that most likely will happen after you get the hang of playing with one of the decks). What I find really cool is the fact that each card can be utilized 5 different ways. So, while players are using the same card decks, they will most likely be played very differently each time. The game provides many strategical choices to the players without having really any necessarily "bad" choices - each player must work on what strategy works best for them and their current situation (remembering to adapt to your opponents as well). I really like this game a lot, my only concern stems from the amount of options presented to players which relies heavily on reading and remembering text (there are helpful icons used in the game, but until players are more familiar with the certain cards, games can be considerably longer as players are trying to understand all the options presented to them and how all the cards are going to interact while played). 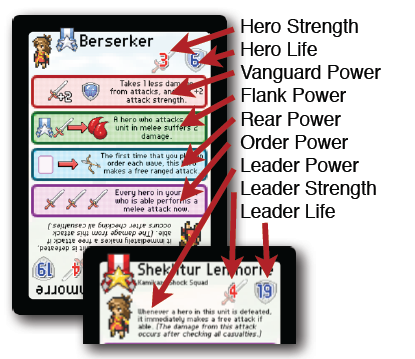 To begin each game, each player looks through their starting hand and each player selects a "leader" that will stand in the center of their unit and which will greatly effect the strategy used by that player for that match. Each card has a "leader" side which has a special leader power. The goal of the game, to destroy your opponents leader while protecting your own. Your leader stands in the center of it all and all other cards are placed around that leader in one of 8 different locations. Each hero played will have different abilities or actions it can take depending on where the player decides to place that hero. The cards are themed very well and I am amazed at the plethora of special actions that were created for all of the cards. They are all pretty exciting and everything just works. The game includes reference cards and tokens to keep track of damage points. The quality of the components are good and the instructions fold out to provide a playing mat (this can be helpful for beginner players). The general idea and concept of the game is pretty straight forward and the rules cover that pretty nicely. The real rule issue with this game comes from very specific questions that may arise about how certain abilities or cards interact. The game seems very prone to confusion as players get used to all the cards and associated actions. Most areas of question are discussed and resolved via boardgamegeek.com discussion forums or Level 99 Games is great at getting back to any questions you may have. I won't get into any further details on specific rules or game play, but the game is very solid and I really enjoy all the different characters. Pixel Tactics 2 gives a new set of characters with even more possibilities. I think that whoever would enjoy Pixel Tactics would probably want to get a hold of Pixel Tactics 2 and any other sets (there will be more!) including some really fun promo cards (there is even a Tom Vasel - pretty great stuff). In closing, the game is really fun, but some may be turned off due to "option overload" and feeling like they have to keep reading card options over and over again and trying to keep track of what each hero can do. I will suggest to those who pull out Pixel Tactics to play it for the first few times to take time and enjoy reading and discovering all of the cool actions and characters. Don't view learning the actions and characters as a "chore," but take a minute to realize how great all of these characters and actions are. You can check out my video review of Pixel Tactics below. Definitely check out Pixel Tactics and that is How Lou Sees It! Level 99 Games has another game, Argent: The Consortium, which is about to finish a very successful Kickstarter project with many cool stretch goals (including some Pixel Tactics cards). Only about a day left to check it out. I will be posting a little interview that I did with Brad later today or tomorrow!